I got some GREAT deals on some very cool items at the CHA SuperShow crop event. The crop benefited the Leeza Gibbons Memory Foundation. I got to do the introductions at the event and had a blast hanging out with the amazing and energetic women from Scrapbook Royalty. I tried to win some of the raffle items, but I wasn't that lucky. 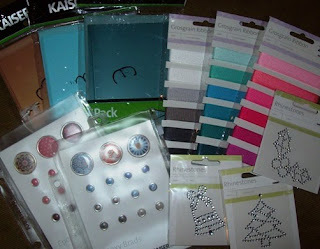 But I did find some great deals, like these cards, ribbons, and embellishments from Kaiser. Can't wait to have some cardmaking playtime!